My reserves of (unpainted) lead are organized (a very loosely applied term) in various locations, somewhat related to era/manufacturer. The first location surveyed was the Blue Mini drawer case, which is mostly Old Glory Renaissance and Byzantine stuff. The idea is to gradually survey the other locations and sort and total the troops by era and army as I expand (and hopefully, contract) the Census. Last Sunday Barry and I got together for Game 1 of our "Lannes" campaign series. 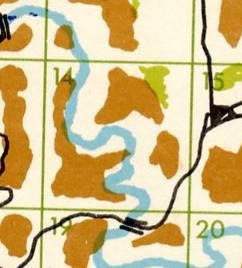 As you might recall, we generated some rather unusual and rough terrain. which I set out as seen below, making good use of my GeoHex collection. View from the South; the bridge is outside of the actual [playing area, Barry chose the orientation for the battle, i.e., North South. View from East to West. I, Francois Faucon, chose which side of the table to take, and I took the Southern side. We each could set on up to 12 " on to the 6 foot by 6 foot playing area. Blow up of the Warplan 5/5 district the battle takes place in. Using the system in Field of Battle, 2nd edition, we tossed and Barry had to deploy a command group first. This was fortunate as one of my three command groups would be delayed in arriving at the battlefield. It turned out to be one of my two infantry commands. Boris Badenov (Barry) set up 1 large infantry command to East of the Gorge, and I countered by deploying my strong Cavalry command opposite it. Barry then deployed his cavalry to the West of the Gorge, and I deployed my Infantry to the West as well. Barry then concluded the set on by deploying his second Infantry command to the West as well - rather crowded there! Finally, I secretly rolled for when my errant Infantry command would arrive, and got a "5", about average for the dice I rolled. Finally, it transpired that the French would start with 15 Morale Points to the Russian 13. Another view of the French set on, seen from the East. The Russian set on, also seen from the East. We started the game and turned everything but MOVE cards the first turn until the last few cards in each of our Sequence decks. In the event, I was the first one to turn a MOVE card, and rolled up a Triple Magic Move for my cavalry, and a Double move for my Infantry. The infantry moved atop the rocky hill overlooking the Gorge from the West, setting up a thin defensive line with no reserves to speak of. I made good use of the special rule applying to skirmishers in Class II terrain; my OOB had three units of Light Infantry, which were very useful with all of the difficult terrain on the table. My cavalry command of three units of Chasseurs a Cheval galloped forward the full 36 inches to intimidate the opposing Russian infantry. View of the West side of the Gorge from the Russian perspective. 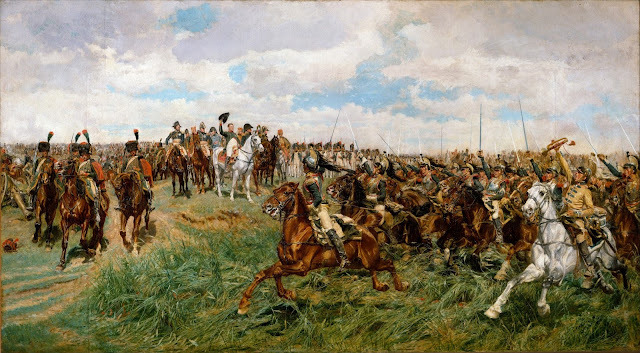 The Russians get a single Move forward, with a newly painted regiment of Dragoons in the lead, encouraged by their Heroic general, Boramirov. A double magic move by the Russians on the East side lead to them advancing cautiously whilst maneuvering to guard their flank from the pesky French chasseurs. Overview of the Battlefield at this early stage. My off table command has used 2 Cards out of the 5 needed, but they flubbed their MOVE roll for one of them with a "1", so it is still 4 more MOVE cards before they appear. It may be a long day for the Sons of Liberty! Close up of the Eastern Russian infantry, led by the epileptic General, Trembalalotsky. Being newly painted troops almost to a man, they get another moment in the sun! A timely Magic Move allows Simeon Souris, a rather timid fellow, to make some adjustment of the French lines, and unlimber his foot battery. With an ARTILLERY FIREPOWER card turned next, the battery tests the range to the dragoons, producing some smoke and forcing the Russian Dragoons back with losses. The Russian Infantry under Brigadier M. Smartov advances West of the Gorge, whilst the Dragoons lick their wounds. General de Brigade Blaize Bassier, having accomplished his objective by slowing down and distracting the the Russian Infantry East of the Gorge, decides to pull his troopers back to shield them from possible cannon fire should the Russian battery chose to unlimber. Scouts tell him that the remaining French Infantry Brigade is now expected fairly soon. The reports are true! Renee Renard and his infantry brigade enters the action. General Renard rolls up a Triple Magic Move on a MOVE ONE COMMAND . Unfortunately, he is a Fabian General, and many of the units in his command flub their tests and thus are unable to make use of more than one Move segment! Still, their arrival (previously designated to be on the East side of the Gorge) lifts French spirits. An issue of Brandy lifts them more. West of the Gorge, the Russian Brigade advances on the French defensive line. The very rough, rocky hill (Class III terrain) has slowed down their advance considerably, which has been a big help to the French thus far, with their late arriving command group gaining the time to make an appearance. Russians on the advance East and West of the Gorge. Renard's Brigade has advanced and deployed, with the Light troops in the lead. The Artillery of Souris' brigade takes another shot at the advancing Russians of M. Smartov. East of the Gorge, it looks to be crunch time as the Russians close to engagement range. General de Division Faucon is seen off in the distance, struggling to keep his scattered forces In Command. Falcon's eye view of the Russian attack. The French Artillery firing double canister at point blank rips great holes in the Jagers, who stream to the rear in rout. The lead Russian regiment exchanges fire a supporting Line Infantry regiment. The Russian infantry is forced back with losses, and that makes an opening for the Russian Dragoons to charge the now unloaded French guns. In so doing, however, they pass in musket range of the skirmishing Light regiment near the Gorge and take fire, which halts their charge. . The Russian artillery battery, having unlimbered outside of musket range, pounds the nearest French infantry regiment. The Frenchmen hold but suffer heavy losses. East of the Gorge, both opposing infantry Brigades deploy for action. A lucky, long range shot by the French battery hits the Russian battery, shaking it. West of the Gorge, the Russians press the attack. The Russians succeed in over running the French battery, Seeing this, General de Brigade Souris orders his outnumbered men to fall back, If he can avoid more losses here, there may be time to win the battle on the East side of the Gorge. In the Russian ranks, there is a buzz of dismay as a stray musket ball fells the brave brigadier Boramirov! (being Heroic, he rolls for survival with a D8 instead of a D12, although he adds an UP 1 in melee for any unit he is attached to). East of the Gorge, Brigadier Bassier judges the moment right for a charge on the Russian infantry. The lead unit is peppered with musket fire and chickens out on its charge, but the second regiment of Chassuers charges home! Surovov says "The musket is a fickle friend, but the bayonet is a sturdy fellow!" French sabers prove superior, though, and the Russians are forced back with heavy losses. Meanwhile, the French Legere skirmishers make the first of many unsuccessful attempts to discomfort the opposing Russians. In a Blaze of Glory, the French cavalry dispatch the survivors of the charge, and then threaten a now isolated Russian Jager battalion. We see their flank, mon General! Mon General? Oh no, he's hit! Fortunately, General Bssier's aide de camp is swift to Assert Command over the Cavalry. Displaying their legendary cool. the Russian Jagers force back the hapless French Legere by firepower, and then form square, thumbing their noses at the frustrated French horsemen. West of the Gorge, Souris' Brigade has continued to pull back to stay out of an uneven combat and guard the approaches to the bridge. The French continue to pick on the isolated Russian Jagers, while the Russians maneuver to guard the flank of the Brigade. West of the Gorge, the Russians renew their advance, with the dragoons looking for an opening to charge. Overview of the battle, as nearly surrounded Jagers are hit, bringing the Russian Army to Zero Army Morale Points. Barry turns an Army Morale Card shortly thereafter. The Russian (green) D10 score needs to beat the (red) French D12 roll. As seen above.... it does not. The Russians grudgingly disengage, and the battle of Ainsworth Gorge is over. General de Division Faucon considers himself quite fortunate to have achieved this most marginal of victories. Morale point losses were exactly equal for the battle (13 each), and only the fact that the luck of the draw gave the French 2 make MP's than the Russians, and the timely Russian ARMY MORALE card prevented a French loss. We had a lot of fun playing out this first battle of our "Lannes" campaign. The unusual terrain and the small forces involved made the action tense, if a bit slow to develop. It will be interesting to see the results of the post battle process upon the units and Generals of both sides... but that will have to wait for another time. Down Styphon! "The Lord Kalvan Saga Storms to an End!" John Carr has announced the final volume in his continuation of H. Beam Piper's classic paratime novel, Lord Kalvan of Otherwhen. The hardcover book is available for preorder now, with delivery expected in the summer of this year. As usual, these very well produced books are pricey ($38 including shipping for Down Styphon! ), but E-book versions of all of the other volumes to date are now available from Amazon, or, preferably, direct from John. Cover art for "Down Styphon!" After years of war against Great King Kalvan, the control the Styphon's House once had over the Five Great Kingdoms is in serious jeopardy. In Hos-Bletha there are two Great Kings, and in Hos-Agrys the Prince Regent's rule is threatened as the Prince nears his Majority. In Hos-Harphax, the new Great Queen is taxing her subjects to the breaking point, while in Hos-Zygros Great King Phidestros openly despises Styphon's House. It is only in Hos-Ktemos that there is a stable regime that openly supports the Styphoni. Nos-Hostigos is at peace for the first time since Kalvan was deposited on the Aryan-Transpacific, Styphon's House Subsector timeline. Local threats in the Middle Kingdoms have been neutralized, Styphon's House is devoting it's energy to regaining it's former strength and influence in the Five Great Kingdoms. Some of the new Great Kings have no love for the House of Styphoni and its quest for power over them and their realms. However, the resources of the Fireseed Temple are huge, including large mercantile houses, tobacco and grain monopolies, and the great Banking Houses. Against this backdrop, Great Queen Rylla decides that now is the time to reassert Hostigi power and return home to Hos-Hostigos. Not everyone is happy with this turn of events, but Rylla is a virtual Force of Nature, and asserts her will. Now it's up to her consort, Great King Kalvan, to find a way to make their return to the Princedom of Hostigos a permanent one. His first task will be to defeat the Zarthani Knights and capture their great fortress at Tarr-Ceros. If he's successful there, he will next have to beard Styphon's Archpriests right in their own Holy City of Balph... the very heart of their power and influence! My own copy is now on pre-order! Yes, we're at it again! This time James is the lead GM and will be using 15mm troops. The game will cover the Winter 1807 Eylau campaign, with each player commanding a Corps. Russ Lockwood's "Snappy Nappy" rules will once again be used (and it looks like Russ himself will once again be a player). James has developed some simple, quick supply and attrition rules to reflect the effects of bitter winter weather. As was the case historically, the French will be caught with their proverbial pantalons down, spread in winter cantonments, being caught very much by surprise by the sudden Russian winter offensive. This is a really unique kind of event, and well worth the trip to participate. Seev the Snappy Nappy label on the side bar for accounts of our previous events - Waterloo 1815, Dresden 1813, and Bavaria 1809. OK, so this is Friedland, 1807; it is a much more inspiring picture than the dreary ones of Eylau! I actually have a large, framed print of this painting hanging in my study that my late father obtained and framed for me (complete with a light) some 45 years ago. Using simple and ultrafast rules, each player commands an independent corps of troops maneuvering across multiple gaming tables in a giant multiplayer one-day re-fight of the entire Napoleonic multi-week campaign. All troops provided!